Following a number of queries about establishing Athens authenticated access to the audio content in the BL: Archival Sound Recordings collection, we are currently awaiting receipt of the HE licence from the BL for our review. It is expected that we will be able to provide access to the audio content fairly early in the new year, and will set up access routes once this is available. Posted in British Library on December 20 2006 by Resource Discovery and Innovation Team Manager. Access authentication to the Verdict Research database service was temporarily unavailable earlier this week, but access has now been restored. Posted in Verdict on December 20 2006 by Resource Discovery and Innovation Team Manager. Journal Citation Reports allows you to evaluate and compare journals using citation data drawn from over 7,500 scholarly and technical journals from more than 3,300 publishers in over 60 countries. It is the only source of citation data on journals, and includes virtually all areas of science, technology, and social sciences. Journal Citation Reports can show you the: most frequently cited journals in a field; the highest impact journals in a field; and the largest journals in a field. Citation and article counts are important indicators of how frequently current researchers are using individual journals. By tabulating and aggregating citation and article counts, JCR offers a valuable tool for journal evaluation and comparison. 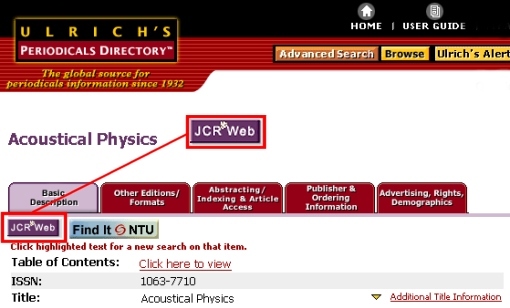 For each journal listing in JCR a direct link to the record for the title in Ulrich’s is provided (see illustration below [click on thumbnail for full-size version]). Posted in JCR on December 20 2006 by Resource Discovery and Innovation Team Manager.